Inspired by organic and geometric design, I began exploring 3D jewelry using lost-wax castings and fabricated hollow forms. During my evolution as an artist, I have explored architectural silhouettes, sacred symbols, botanical elements, and geometric shapes with an eye toward function, beauty, and playful imagination. My latest jewelry line pays homage to movement through form, function, and space. 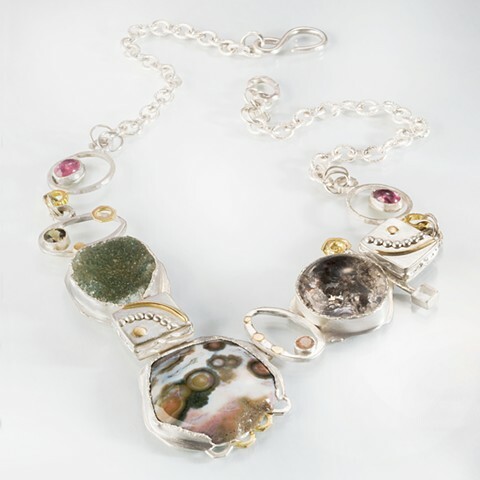 I integrate traditional forging, piercing, raising/sinking, and overlaying of metal with carved/cast elements in sterling silver and 14/18/22 karat gold, accented with unique gemstones and pearls. My designs are often heavily textured with chased and tooled surfaces with a variety of stone setting techniques. My moving sculptures collection unites organic elegance with modern lines and captured spaces to create bold, beautiful, and wearable art.